There’s just something about taking photos with an actual camera, isn’t there? It’s something that’s missing when you use the camera on your phone. Not that there is anything wrong with your camera phone. In fact, they are usually on the same level as many professional cameras. However, there is something fun about holding a camera in your hand and taking photos. You might even be thinking about investing in a camera for yourself. Though, you may be overwhelmed by the possibilities. There are so many different types, brands, and levels when it comes to cameras. How do you know what is the best camera for beginners? It’s hard to narrow down to one specific best camera for beginners. After all, everyone has different needs and speeds. But we can show you what to look for in a camera, so you can get the right one for you. Why Do You Want a Camera? The first thing to think about is why do you want a camera? Do you want to take photos every day, for special events, or to do it as a hobby? Depending on your answer one type of camera will be better than another. A compact camera would be better for carrying around. A DSLR would be good if you are trying to do it as an art form or hobby. Special events could let you can get a pretty cheap camera. Photos or Videos or Both? Do you want to focus only on photos or do you want to make movies? There are certain models that are better at videos than others. If you want to do both, then you need to find a camera that can handle both well. They may also offer special features that you don’t see with plain photo taking cameras. Manual Mode: This feature lets you take full control over the exposure of an image. In automatic mode, the camera takes care of a lot for you. ISO controls how sensitive the camera’s sensor is to light. You increase the sensitivity, so you can shoot in darker conditions without a flash. You should look for cameras that offer an ISO of 1600 or higher. Megapixels: These are a measure of the resolution of a camera. The more megapixels, the higher quality the photo will be. However, the more megapixels, the higher the price will be. Ergonomics: Ergonomics are a big factor too. You should consider how the camera feels in your hands. If you are going to spend a lot of time with it, it needs to feel good. Things like size, weight, and durability are important to consider. Proper Focus: Focus is key to good photos. It draws the viewer’s eye through the image to where you want them to look. The quality of a camera’s autofocus is definitely worth thinking about. DSLR stands for digital single-lens reflex camera. This tends to be the most popular beginner’s camera. It’s the camera that people tend to think of when they think of stepping up from their phone. It does give great images, but they do depend on the type of lens you use. A perk of this type of camera is the fact that you can change lenses any time you want – and that means you have more control. However, this camera can be a little overwhelming for some beginners because they have so much control. There are different lenses, buttons, and menus to master. They are also kind of heavy compare to other types of cameras. This is a newer type of camera that is still evolving. It’s getting to point where it’s becoming tough competition to the more professional cameras. With this type of camera, you aren’t looking through a mirror to see what you are taking a picture of. Instead, you are seeing it through a viewfinder. They offer quality images and different choices of lenses. There is a lot of growth opportunities with this camera. It’s also small and light – which makes them easier to carry around. 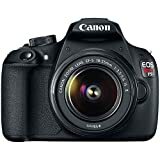 However, they are somewhat complicated like the DSLRs, which can be off putting to some beginners. And, their battery life doesn’t tend to be long. Plus, they can be a bit expensive for some. There are also Bridge Cameras, Point-and-Shoot Cameras, and Film Cameras that all share their own pros and cons. Though the two types we listed above tend to be the most common. We looked at what photographers’ themselves thought was the best camera for beginners. We did this because they know what to look for when it comes to what a beginner needs to get started. They themselves were beginners at one point and understand the struggles that you are going to face. Once we had a list of cameras to look into, we start comparing pros and cons for each. We then went to a consumer site like Amazon and see what others thought of it. These people are in a similar place as you and have nothing to lose by reviewing. We did our best to find different kinds of cameras at different prices. This is so everyone will hopefully find a camera that suits them and their needs. This camera has ultra-fast focus with 179 AF points and 6Fps. It has high resolution and can instantly share with your smartphone. You can record full HD 1080 video as well. It’s half the weight of a DSLR, but has all the same power and capabilities. It has a flip up touch screen so that you can see from all angles. And, there is also a built-in pop-up flash for situations that need extra lighting. You can even add apps to this camera to improve it. It features a rechargeable battery, AC charger, lens cap, shoulder strap, and a micro USB cable. We give it a 4.2-star rating. People like this camera because it’s easy to use, it’s powerful, and it takes great shots. People have complained about the touch screen not working as well as it should, the battery power could be better, and it’s not very intuitive. This is a travel zoom camera with an eye viewfinder. It has low light sensitivity for improved sharpness, even without a flash. The viewfinder is designed to deflect sunlight glare. And, it takes clear pictures and videos. There is a lens mounted control that allows for easier manual control for exposure, zoom, and focus. This makes it easier to focus on the shutter. It is able to capture moving subjects at high speed thanks to its 10-frames-per-second, high-speed burst shooting. It also will record high speed videos as well. This gets a 4-star rating. 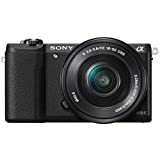 The pros of this camera are its ability to handle bright situations and still get a good photo, it takes very sharp photos, and it’s a good size to carry around. Cons are that dust can collect around the lens and affect zooming capabilities, the buttons are too close together, and the customer service could be better. This is a lightweight and easy to use camera. It can handle both photos and videos. It creates sharp images due to its fast and powerful image processor. And, it has a touch screen that can move in different directions, so you can see everything in every situation. It offers a feature assistant function to help you through a shot. And, you can also share your images thanks to its built in WiFi. You can film video at 60-frames-a-second and still have it be smooth. It even features an internal microphone. We give a 4.6-star rating. Perks of this camera are that its lightweight, people are getting great shots, and it’s easy to use. A few cons – it can look cheap to some people, it’s not great in low lighting situations, and the battery life isn’t the greatest. This camera has a large high-resolution sensor and broad ISO range to create sharper images. It also features an interchangeable lens. You can even share your photos instantly with your smartphone or tablet. There is a touch display that you use to swipe, pinch, zoom, and focus with which flips in all directions. It will also store your images in its cloud. This Nikon camera films high-quality HD movies and even has a near-silent autofocus. And, it works in both high and low lighting. 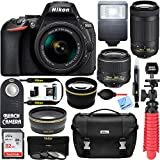 This bundle includes a camera case, memory card, rechargeable battery, charger, rubberized spider tripod, wired shutter release remote, bounce zoom flash, dust removal blower system, lens cleaning pen, memory card wallet, card reader, mini tripod, screen protectors, lens cleaning kit, and a microfiber cleaning cloth. We give this a 4.4-star rating. People like this camera because it’s a professional grade, it’s easy to use, and is a bundle. A few cons – people have complained about the accessories being a little cheap, the remote doesn’t always appear to work with the camera, and the instructions could have been better. This camera lets you zoom, crop, and more – without losing quality. It has 25x optical zoom and a 24 mm wide angled lens. It will also detect facial features and enhance it for better images. This Kodak will even let you touch up any blemishes after the fact – rather than having to do it in a separate app. This camera is good for beginners because all you do is point, frame, and shoot. It can handle both photos and videos with ease. We give this a 3.3-star rating. Pros of this camera are the zoom is great, it’s easy to use, and the amount of features it has. Cons are that the lens cap falls off often, the battery doesn’t last long, and there doesn’t seem to be instructions that come with it. Buying the best camera for beginners does have its challenges. The key is to know what you want. Like we mentioned before, you need to know what you are going use it for. Once you’ve decided that, it will narrow your choices. Make sure it has all the features that you want. Also, consider your budget. These cameras can get pricey fast. Depending on what camera you buy, you may also need to get accessories for it as well. Make sure to read the reviews before you buy anything. These people have tried the camera already. They will tell you if it works or not. They will point out the real perks and the takeaways. They can really help you decide if that is the camera for you. Remember that just because a camera is labeled “best camera for beginners”, it doesn’t necessarily mean it’s best for you. You really need to think about what you want from a camera before you make an investment. Check out some photography blogs if you need more information. These are usually written by real photographers and they can give you more insight. Once you find the right camera for you, you will have a lot of fun exploring the world of photography through your new lens.